Amanda, aka, Too Tall Fritz! Congratulations to Amanda, who will receive a trio of delicious hot cocoa from Bellagio Gourmet Cocoa and Chocolates. This stuff looks so good, so I hope Amanda enjoys it. I am so excited. My Kindle is loaded (thanks, Erin!) and my camera is charged. I have several bottles of sunscreen and have no plans for next week other than eating melting chocolate cake, reading wonderful books and spending time with my favorite guy. But, I do have a few blogging things planned here, so stay tuned. Please note that comments will not show up during the next week as I will have no Internet access (the only way I would get a true vacation). 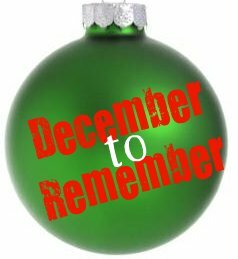 Come back after next week, because the December to Remember Giveaway Series will pick up again with some awesome goodies! Have a great time, Kelly!